I saw this gem of a meme on Facebook the other day; it says, “End the War on Halloween! Put the “Hallow” back in HALLOWEEN!! !” This meme’s creator is riffing off of the old “Put Christ back into Christmas” campaign of the past few decades as well as noting the Christian side of this frequently pagan-associated holiday. The origin of the holiday’s name, “Hallowe’en” comes from “Hallows’ Eve,” refers to the Christian holy day (origin of the English word “holiday”) of All Saints’ Day, now celebrated on first day of November. In its earliest appearance, All Saints’ Day (or its conceptual predecessor) was celebrated in the diocese of Rome sometime in the month of May. It’s entirely likely that All Saints’ Day came to be celebrated on November 1st (and All Souls’ Day on November 2nd) in an attempt to Christianize a somewhat similar Celtic pagan holiday called Samhain which fell on those same days. 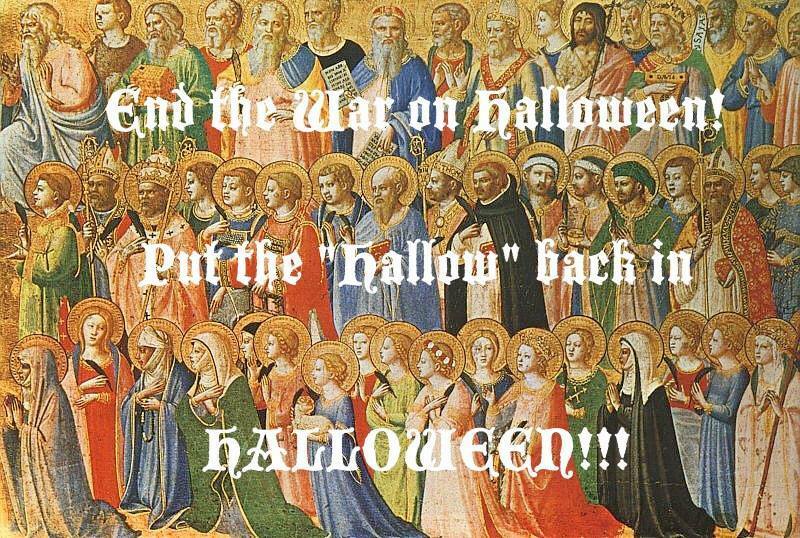 While I’m sure that the creator of this meme earnestly meant his message of returning to the “saintly” origins of Halloween, I’m also sure that the majority of people who see the image have a nice little chuckle at the idea. Halloween is so far removed from All Saints’ Day in the minds of most, so closely associated with dark, evil, and demonic imagery, that more Evangelically-minded Protestant and Catholic communities try to encourage Christian versions of the holiday and its traditions instead. You have to admit that there’s some irony in trying to Christianize an originally Christianized holiday. Can we even put the “hallow” back in Halloween at this point? When I was trying to think of anything in the modern manifestation of Halloween worth trying to Christianize (my conclusion: no), it struck me that, despite the fact that Halloween seems to celebrate the macabre, there is something inherently Christian—Catholic, particularly—about much of the Halloween spirit. Just as the origins of Halloween, despite pagan influences, are inherently Christian, so too do many of the hallmarks of Halloween, such as ghosts, demons, paranormal events, and even vampires, come out of the Christian tradition. In our contemporary culture there is an overwhelming fascination with supernatural and paranormal phenomena. Ghosts and ghoulies, demons and angels, fairies and mediums, vampires and monsters, and all manner of things that go bump in the night populate the popular imagination and much of the movies and television shows which Hollywood churns out. There are something like five different shows on television solely about hunting ghosts, not to mention such popular supernatural dramas as “American Horror Story,” “The Vampire Diaries,” “Grimm,” “The Walking Dead,” “Sleepy Hollow,” “The X-Files,” and, of course, “Supernatural.” Now, the genre of demonic possession and exorcism stories aside (with their usually inept portrayals of Catholic priests and rituals), it would seem that these tales of terror have little to nothing in common with the Christian tradition. 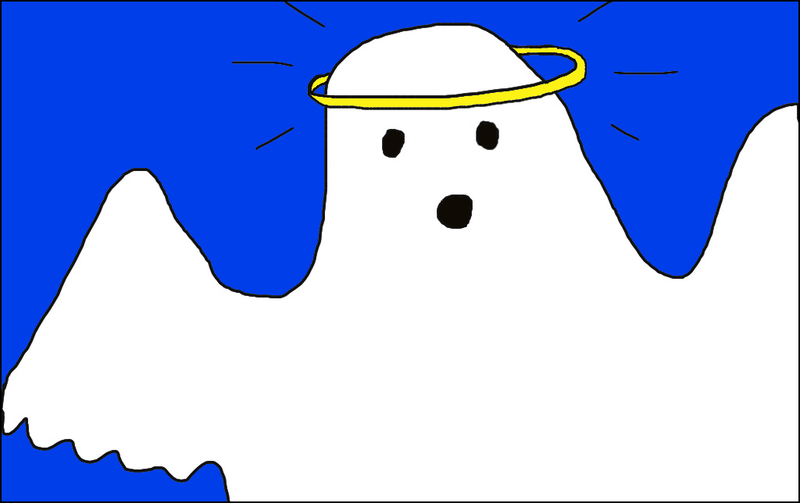 But as Christine McCarthy pointed out in her post on Monday, the popular concept of ghosts and the Catholic understanding of the afterlife have much in common, no doubt because much of ghost lore comes right out of the Catholic traditions surrounding death and the afterlife. And we don’t need to discuss vampires for very long before we can pick out how vampire lore has twisted Eucharistic practice (drinking the Blood of Christ for the sake of eternal life) into a horrific concept which seems tailor-made to terrify God-fearing Catholics (but never fear, vampires can be repelled by a handheld cross!). These are just a few explicit examples of how the horror genre takes concepts straight out of Catholic practice and tradition, but I think that a closer look at the foundations of both paranormal tales and Catholic tradition will shine light on the implicit similarities of these two seemingly-opposite concepts. Now, I am not arguing that much of what features in the horror/supernatural genre is, in fact, actually Catholic so that I can push for a campaign to “take back” these concepts and recast them in a light of faith. Catholic zombies would benefit no one (I hope). I am arguing, however, that much of what lies at the foundation of these tales of strange happenings and strange creatures, and, especially, our ongoing and overwhelming urge to hear, tell, and create these paranormal stories, is actually a common human yearning for and fascination with the supernatural world. The reason that these spooky stories are so compelling is the same reason that Christians from liturgical traditions find liturgy and the sacraments so compelling: a sacramental imagination. Now, a sacramental imagination is, at its foundation, an understanding of the world as made up of the physical as well as the spiritual. Human beings, for example, are corporal (having bodies) as well as spiritual (having souls); when we die, we cease to live corporally, while our spiritual selves live on. This is the basis for much of Catholic thought and practice (Heaven, hell, purgatory) as well as the more general Western cultural understanding of ghosts (the souls of the dead trapped in our world). This is a conception of the world as, on the one hand, charged with the grandeur of God (to paraphrase Gerard Manley Hopkins), and, on the other hand, filled with the wondrous, fearsome unknown. Our physical world is one that we can feel, taste, see, examine, catalogue, and commit to memory, but within it there remains something…else. It is the spiritual dimension of the universe, the aspect of our existence that is beyond our grasp, but which we nevertheless can sense, the portion beyond our comprehension, but which we nevertheless strive to understand. A sacramental imagination further understands that the physical and the spiritual worlds are not opposed or absolutely separate from one another; in certain objects, at certain times, through certain prayers or rituals, the spiritual can be sensed or communicated through physical means. This is, at its most basic, how the Sacraments work: God’s grace is communicated through physical, sensible means and has real effects upon us. Through the waters of baptism and the work of the Holy Spirit, a sinner is both physically and spiritually washed clean of sin. Through the bread and the wine consecrated by the priest and alongside the celebrating community, I am incorporated into the Body of Christ by consuming the Body of Christ of the Eucharist. Sometimes I wonder if our cultural obsession with the paranormal and supernatural isn’t simply an expression of our common yearning for people, places, moments, words, and rituals which can put us in contact with the “other side,” or a craving for awe-filled, numinous experiences which make us stop and reconsider our world and our role in it. It amazes me that, for the sake of entertainment, people are willing to believe that ghosts can be sought, seen, and even captured through scientific means (ahem, Ghostbusters), but that, for the sake of everlasting life and spiritual communion, they refuse to entertain the idea that God can come into our lives through the sacred rituals of the Sacraments. Perhaps most importantly in all of this comparison of paranormal fascination and sacramental imagination is the common understanding, in Christian tradition and supernatural lore, of the cosmic battle between Good and Evil, played out both on a grand scale and in the minutia of our daily lives, here on earth. At their most basic, virtually all horror stories revolve around a dramatic struggle between good and evil. Yes, the tropes are tired and clichés abound, but in these stories evil is real and palpable, often personified, and must be overcome. The hero or heroine is rarely perfect, but nevertheless he or she can and must fight and defeat evil for the sake of others; the hero and heroine represent the good that even imperfect people can bring about in the world. While I would never argue that a horror film is actually a morality play in disguise, I find it interesting that these “secular” tales draw upon sacred tradition with the effect of reinforcing for audiences the concept that good can always overpower evil. So can we put the “hallow” back in Halloween? I’m not sure. But it seems to me that it might already be in there, if we know how to draw it out. As I have discussed, there are seeds of a budding sacramental imagination in our Halloween celebrations and our cultural fascination with the paranormal. Perhaps there is even a possible avenue for evangelization there. After all, it just may be that the very spirit that all of those ghost hunters are seeking is, in fact, the Holy one. This is a great article. However, i mentioned these points to some people and their reply was this… “Halloween is a demon topic and apologetic professors or theologians are not the best qualified to preach on this subject and therefore are likely wrong. The two best exorcists in the church (Amorth & Fortea) have openly said that a good catholic should not celebrate halloween and since they specialize in demons, they are the voice to follow on this, not apologetics, theology or historical facts.” Clearly these people were upset of the points i mentioned and used this as their only support to say halloween is a celebration of the devil and the two most famous exorcists of the church share my opinion. What would you say to such a reply? Thanks for your thoughts, Juan! I’m happy to hear that my post jump started a theological conversation between you and friends. I understand your concerns, and I want to be clear that I would never encourage people to celebrate Halloween in it’s spooky modern incarnation as a Catholic holiday. Nor would I encourage people to dabble in any activity that might encourage interaction with demonic activity. My point in this post was that Halloween’s *origins* are Catholic (as the Eve of All Saints’ Day) and that we won’t ever be able to recover the Catholicity of Halloween (nor should we want to, I think). Moreover, I was noting the parallels between many contemporary beliefs about “the paranormal” and how they might relate to the Catholic worldview of a sacramental imagination. Essentially: it’s a strange sort of modern secular superstition to believe in the paranormal and even the demonic and not the grace to be found in the sacramental. And perhaps the sacramental imagination is a way to evangelize to people, to pull them out of mere superstition and interest in the supernatural, and welcome them into life filled with God’s supernatural grace in the sacraments. I hope this helps to clarify things for you! Yes it does. Thank you! I think you are right that Halloween has its roots where you see them, and that a sacramental imagination can see much of value in the holiday. I don’t think one has to go far to re-Christianize it though (or a part of it at least. The shift from a children’s holiday to an adult one with costumes like the slutty vampire, slutty witch, slutty nurse, slutty you name it may obscure the point). The point at which I think it is most Christian is the one where you see the cosmic battle between Good and Evil. I don’t see that at all. I see a holiday that is carnivalesque, where the usual hierarchies are upended. Christianity itself certainly has this theme deeply embedded– Look, for instance at the Magnificat: “He hath shewed strength with his arm : he hath scattered the proud in the imagination of their hearts.